Utilize all the tools you have available to you when perfecting your boat-control craft. Spot-Lock and electronic anchors make it easy. Cold-water bassin’ can be a riot when you slow down and put the bait right in front of their face. When it’s cold, a big smallmouth will put a smile on your face. By relying on smaller-sized cases, like the LL3 case from Lure Lock, you can quickly grab small jigheads when your fingers are cold. As you begin to target bass this spring, the water temperatures are still cold. This means that the activity level of largemouth and smallmouth bass is decreased. They are still ready and willing to eat, but downsizing your presentation and slowing down your retrieve will help you save your day from being a total bust. 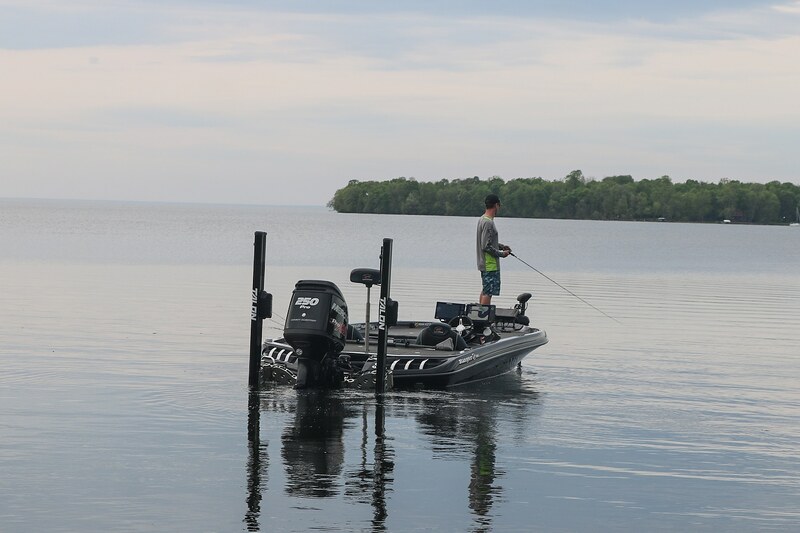 By relying on small, finesse lures, light line and precision boat control, I’m able to stay focused on fishing the isolated fish-holding structure that springtime bass are holding on. 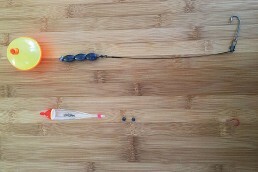 A finesse application that I turn to when fishing cold water, is a shaky head. I’ll use a shaky head jig that weighs 3/16 ounce the majority of the time, because it allows me to make a long cast and maintain a good sense of the bottom. That’s important because that is where the fish-holding cover I’m targeting is located. What makes the shakey head technique/lure so versatile is that you can just shake the jig, upon it resting at the bottom. This retrieve is very effective when casting to isolated cover, so you are able to keep the bait in the strike zone for the longest amount of time possible. 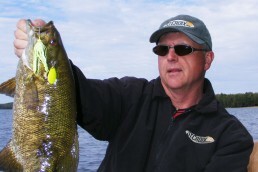 I like to dress my shaky head with a Zoom Finesse worm as it gives the bass a nice, compact presentation to key in on. For colors, I like to keep it simple. I always have a supply of green pumpkin, watermelon red flake and black/blue on hand. The clarity of the water I’m fishing will dictate which color I go with. I’ll fish this on a Witch Doctor Tackle 6-foot, 6-inch MH Surman 50G spinning rod and pair it with a Wright & McGill Victory II spinning reel that is spooled with 8-pound Seaguar TATSU Fluorocarbon line. With this combination, I can make extremely long casts and feel the lightest bite—both of which are critical when fishing for bass in cold water. Finesse just doesn’t mean fishing small lures, it also means fishing slow. 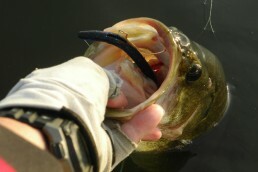 When the water is cold and the bass aren’t moving much, they are looking for a big meal when they do want to feed. That is why tying up a jig is still a viable option; you just have to fish it slow. For a jig, I like to flip a 1/2-ounce All-Terrain Tackle AT Jig in either black/blue or green pumpkin and pair it with a Zoom Super Chunk trailer. This will help draw a reaction strike out of the bass. When flipping a heavier jig, I can flip that jig farther and cover more water. When I flip my jig out to the cover I’m fishing, I’ll let it sink all the way to the bottom. Be sure to watch your line on the fall, because a bass may hit your jig on the fall and your line may only twitch a slight bit. Once my bait hits the bottom, I just let the rod do the work. Ever so slightly, I lift it up and then let it sink. Being able to control your boat will many times dictate how successful a day of fishing will be for you. Fishing offshore has always been something that some anglers shy away from, for one primary reason…boat control. When you are away from the bank, you are at the mercy of the wind. To present your bait correctly to the fish below, your boat control needs to be on point! If your boat is out of position, you can’t make that key cast. If your boat is moving too fast away from that key spot, your lure isn’t sitting in the strike zone long enough. Minn Kota’s Ultrex trolling motor has made fishing offshore easier by allowing the angler to maximize their boat control. By keeping your boat in the precise fish-catching spot via the Bluetooth-enabled Heading Sensor (a digital compass) and Spot-Lock, your boat will be in the exact position needed to replicate a productive cast. This is extremely important. Many times, the angle that your bait is dragged across boulders or a rock point will dictate if that smallmouth will bite. As the air temperatures begin to rise this spring, bundle up, mentally prepare to fish slow and go target bass in that cold water. Like you, they’ve been waiting all winter for some action! When targeting cold-water bass, you want to be able to quickly identify and grab the tackle case that has the jighead you need to re-rig your line. For me, this means relying on the smaller LL2 or LL3 cases from Lure Lock, as I can specifically put one style of jighead in a case and have it stocked with a variety of weights. This way when I need to re-rig and my fingers are cold, I don’t need to be digging through a lot of tackle. I can quickly grab the case and pull out the jighead in the size I want. With the ElasTak gel technology, I’ll know my jigheads will be right where I put them as the gel holds them in place and keeps the jigs from bouncing around the cases and the hook points from becoming dull. Glenn Walker has been fishing Minnesota and Mississippi River tournaments for more than 15 years, spreading his passion and knowledge of the sport via articles and videos. For more information, check out glennwalkerfishing.com or on Facebook @GlennWalkerFishing.